Why Won’t My Engine Start?! Spend some time on any Hunter owner’s forum, and you’ll eventually find a thread discussing the dreaded “Why Won’t My Yanmar Start When I Turn The Key?” issue. The problem goes something like this: you turn the key or push the button to start your engine, and it totally ignores you. Or maybe you hear a “click,” but the starter doesn’t engage. Whatever is causing the problem seems to be linked into the boat’s Crisis Detector circuit, because normally the engine will start just fine when it’s a pretty day and you just want to back out of the slip for a short sail, but it will fail to turn over when there’s a squall bearing down on you and you’re being blown onto the rocks while on a collision course with a fuel barge. We’re not talking here about a significant engine issue, where you’re having a fuel or compression problem or your exhaust elbow is clogged and you can get the engine to turn over but it just won’t start. We’re talking about a transient little electrical problem where the starter solenoid randomly decides it just doesn’t want to do its job today. It’s really annoying because it comes and goes. Sometimes you can go weeks with the engine starting every time, and then suddenly it just says no. And even though it’s a widely reported problem, it’s one that Yanmar claims they’ve never heard of. Go ahead, call them. They’ll say “why no, we’re not aware of anyone having this problem.” Meanwhile I’ve seen posts by people saying that they’ve complained to Yanmar so many times that they’re looking into a class action lawsuit over the issue due to the potential risk it creates for boat owners when they can’t reliably start their engines. 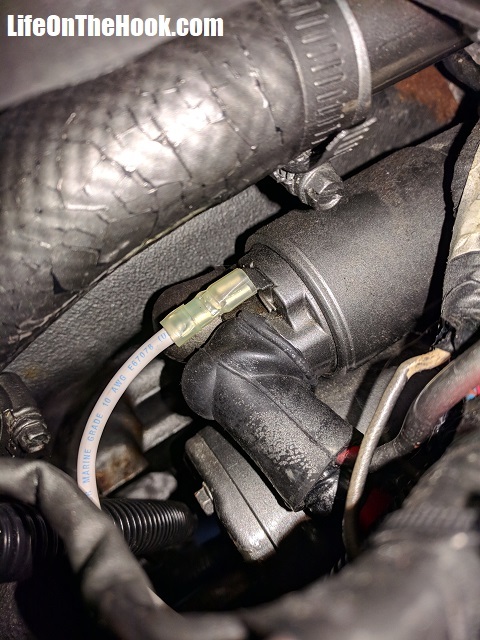 Some have claimed that the way to fix this problem is to install an additional solenoid in the starting circuit. IF you’ve researched this issue I’m sure you’ve seen this fix. I’m not going to go into detail with that solution , other than to say that I think it’s the wrong approach. You’re not fixing the problem, you’re just treating the symptom, while also adding additional complexity to your starting system. We had this problem on our first boat, a Hunter 336 with a Yanmar 3GM30 engine. Over the last year, it has now also cropped up on our current boat, a Hunter 376 with a 3JH2E. On both boats, the solution turned out to be much cheaper and simpler. I believe the problem is caused by the fact that the engine control panel is usually quite a ways removed from the engine, and the builder used a long wiring harness to connect the two. The harness is usually pieced together from shorter lengths and has multiple in-line electrical connectors. With two, three, sometimes four or more wiring connectors in the harness run, there are plenty of places for corrosion to develop and introduce resistance in the circuit, causing a voltage drop in the line. You turn the key to start the engine, but not enough voltage makes it to the starter solenoid to engage it. I think the reason the problem comes and goes is because electrical resistance across a corroded connection can vary due to changes in temperature or humidity. Today might be OK, but not so good tomorrow. So how did we fix the problem? But running a separate, continuous #10 wire from the engine start switch all the way to the starter solenoid. This eliminates all the in-line electrical connectors with their potentially voltage-sapping corroded pins. Engine control panel removed from pedestal, original starting circuit wire removed from start switch. Haven’t crimped a ring terminal on the new wire yet in this picture. Chasing the wire from the engine control panel in the cockpit to the starter solenoid on the engine is the hard part, usually involving some cabin disassembly and a lot of wiggling into dark places. 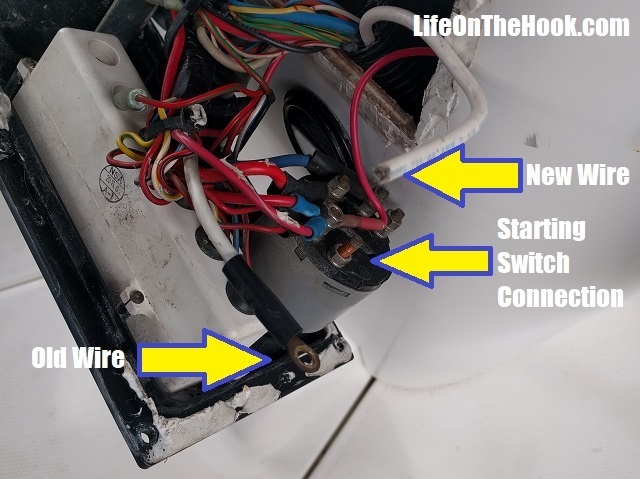 Once the wire is run, however, it’s a pretty simple task to crimp the proper ring connector on the switch end and a disconnect fitting on the solenoid end and substitute the new wire for the old one. New wire attached to starter solenoid. Put some insulating shrink tubing on the ends of the old wire to keep it from causing problems and protect the new wire with some plastic wire loom, using a few zip ties to make sure it stays where you want it, and you’re in business. I followed the exhaust hose for part of the run. 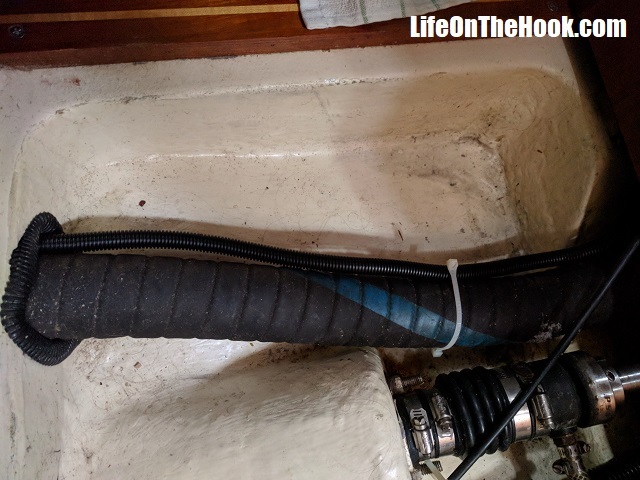 This fix has worked great for us on two boats now. If you’ve having a similar problem (and I think many of you with older Yanmars probably are), then give it a try. I think you’ll be pleased with the results. And it’s such a relief to no longer have to wonder “what kind of mood are you in today, Mr. Engine?” when you reach for that switch. This entry was posted in How? and tagged Fixing Yanmar fail to start, Yanmar starter repair on October 25, 2018 by Robert. Thanks so much for documenting that approach. I haven’t run into this problem yet, but I’m still fairly new at this and appreciate all your detailed posts. I have ran into other problems and ustilized techniques you have described successfully so the day my engine isn’t starting I will remember to check back here first. Thanks again.